I suspect that a lot of people probably have the same reaction that I did when I first head about using acids to exfoliate my skin, which was visions of chemical burns and basically my skin falling off. Luckily for my skin, I took a closer look at these types of products and found that not only are well formulated acid exfoliants less irritating and more gentle than traditional physical exfoliants, but they've completely changed my skin. Honestly, while my skin care routine has gotten pretty intense over the years, I can say without a moment's hesitation that regular use of acid exfoliants has been the biggest factor in changing my skin for the better over the past few years. 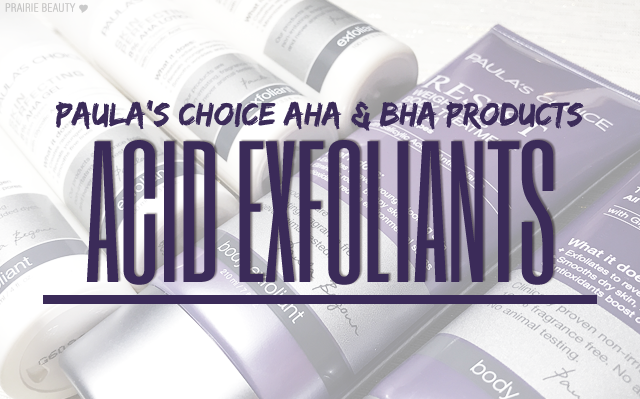 Though one of their products has been in my rotation for years, I recently had the opportunity to try out a whole bunch of different Paula's Choice AHA & BHA Exfoliants* and I wanted to take the opportunity to really talk about the two different types of acids, how they work, and who could really benefit from having them in their skin care routine. So let's just jump right in with how exfoliating acids actually work, which I think definitely will take away some of the uncomfortable imagery that you may have about putting acids on your skin. When we're young, we shed dead skin cells at a very rapid rate, but as we get older that process slows down significantly. What exfoliating acids do is to loosen the bonds between those layers of dead skin cells and your healthy skin underneath, helping those dead skin cells to shed and reveal the skin underneath. While that may sound scary, it's actually really gentle and doesn't have the abrasive propertys of physical scrubs that can cause sensitivity and micro-tears in the skin's surface. Personally, I've never had any irritation, sensitivity or damage from using an acid exfoliant as long as I use it responsibly and make sure to use my SPF. While the basics of how both AHAs and BHAs perform are quite similar, there are also some pretty significant differences in how they behave that make different acids more suitable to different skin types and concerns, so I wanted to get into the differences between the two acids as well. So first, let's talk about AHAs, or alpha-hydroxy acids, and how they work. First off, there are several different exfoliating AHAs. Not every AHA product will be labeled AHA, but when you see glycolic acid, lactic acid, mandelic acid, and citric acid on your products, all of those are alpha-hydroxy acids. AHAs are water soluable and work on the surface of the skin. AHAs are ideal for people with normal to dry skin with signs of aging, because they have shown to not only exfoliate, but also hydrate, boost the product of collagen, and reduce the appearance of lines and wrinkles. Now, onto the subject of BHA, or beta-hydroxy acid. Like I said above, they perform quite similarly to AHAs but also have one significant difference. If you're not a huge skin care junkie, you're probably more familiar with BHA as salicylic acid. Admittedly, for years I've been using products with salicylic acid without ever realizing what it actually did. The significant difference that a BHA presents is that it's oil soluable, so it doesn't only work on the surface of the skin but also inside the pores, making it a really good option for people with normal to oily skin or those who are prone to congested, enlarged pores and breakouts. BHA also has skin-calming properties, so a well formulated BHA product will be gentle enough even for sensitive skin. 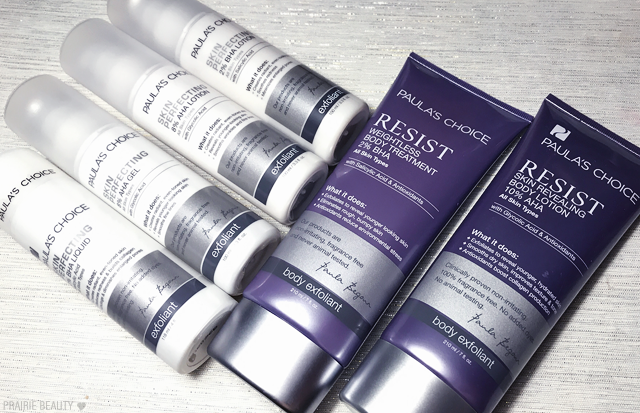 Personally, the Paula's Choice Skin Perfecting 2% BHA Liquid* has been a staple in my collection for years now and it was probably one of the first skin care products that ever really made a big difference in my skin. For a long time, I was really prone to congested pores that caused bumps and breakouts, and since starting to consistently use this product I've seen a complete 180 in my skin. Initially, I introduced it slowly, using it every other night, but these days I can comfortably use this product every single day as a part of my routine and I've had zero issues. If you have dry or mature skin, I would definitely go for an AHA product. Personally, I like the Paula's Choice Skin Perfecting 8% AHA Gel*, because I quite like the gel texture. 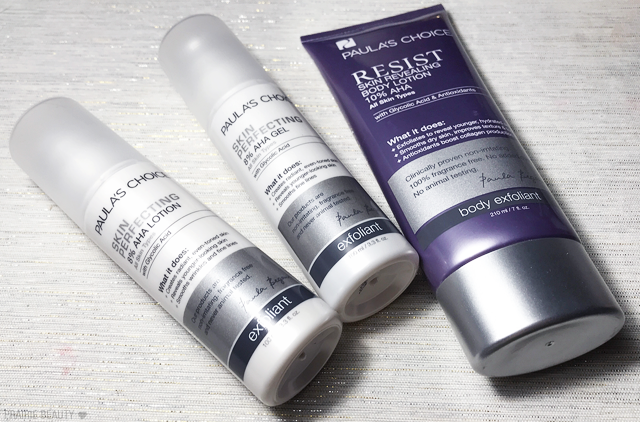 If you have dry skin on your body, particularly during these colder months, I highly, highly recommend trying out the Paula's Choice RESIST Skin Revealing Body Lotion 10% AHA*, which has basically been a revelation for me since I've been trying it. If you have oily skin, are prone to breakouts or struggle with clogged or englarged pores, I definitely think you can't go wrong with the Paula's Choice Skin Perfecting 2% BHA Liquid*, but I also quite liked the lotion so it's just a matter of texture preference as far as I'm concerned. 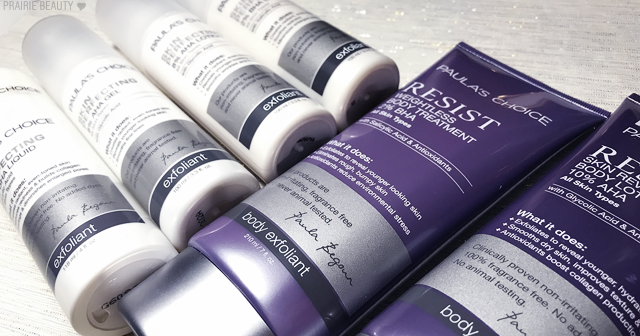 And if you're someone who struggles with breakouts on the body, I definitely recommend checking out the Paula's Choice RESIST WeightlessBody Treatment 2% BHA*. Generally, I feel like what I hope you take away from this post is a little bit more information about acid exfoliants, how they really work, and what might be a good option for you. And I very sincerely think that if you're just dipping your toe in, Paula's Choice products are the absolute best place to start because there really hasn't been an acid exfoliant from their range that I've tried and haven't really, really seen good results from. Also, I find the products to be really affordable for how effective and well formulated they are. 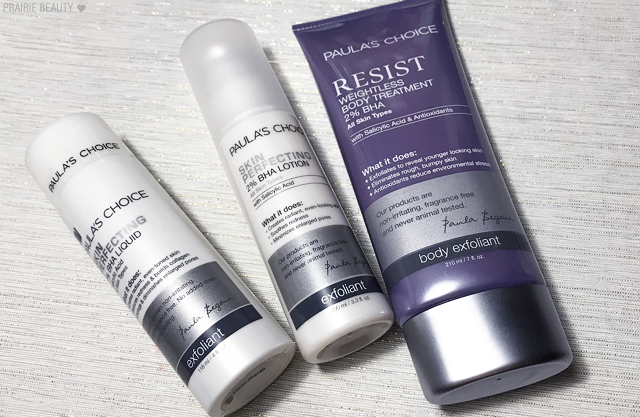 Paula's Choice products are available on their website and they pretty consistently have good promotions if you sign up for their email list, so I'd highly recommend that if you're interested in trying out the products. Thanks for reading! If you have any more questions about AHAs and BHAs, leave them in the comments and I'll do my best to answer them!